Performance Series at Dia:Beacon — Yvonne Rainer :: February 25-26, 2012; 12:00 pm and 2:00 pm + May 13; 1:00 pm and 3:00 pm :: Dia:Beacon, 3 Beekman Street, Beacon, NY. Dia Art Foundation is pleased to present dance works by renowned avant-garde choreographer and filmmaker Yvonne Rainer. This retrospective will celebrate the depth of Rainer’s contributions to dance and will feature her earliest works of choreography from the 1960s — including both iconic and lesser-known pieces — and three compositions created within the last twelve years. As co-founding member of Judson Dance Theater, Yvonne Rainer produced groundbreaking works that echoed ideas of time, space, and seriality that were being explored in the field of visual art at the time. Throughout the 1960s, Rainer and the other Judson choreographers — including Trisha Brown, Lucinda Childs, and Steve Paxton, among others — developed a new vocabulary for dance that built upon nonexpressive techniques and chance procedures, while also incorporating task-oriented movements that brought attention to the physicality of the body. Yvonne Rainer demonstrates Dia’s ongoing commitment to presenting experimental performance and dance at Dia:Beacon through new commissions and retrospectives of historical works. Previous presentations include Robert Whitman’s Prune Flat and Light Touch (2003); Joan Jonas’s The Shape, the Scent, the Feel of Things (2005–6); Merce Cunningham Dance Company (2007–9); Trisha Brown Dance Company (2009–10); and most recently Robert Whitman’s Passport and MoonRain (both 2011). This program is made possible by Yoko Ono and Dia’s Commissioning Committee: Jill and Peter Kraus, Leslie and Mac McQuown, Genny and Selmo Nissenbaum, and Liz Gerring Radke and Kirk August Radke. In 2000, Rainer returned to dance after a 30-year hiatus with a commission by the Baryshnikov Dance Foundation for the White Oak Dance Project titled, After Many a Summer Dies the Swan (2000). Most recently, she choreographed AG Indexical, with a Little Help from H.M. (2006), a reinterpretation of George Balanchine’s Agon; RoS Indexical (2007), after Vaslav Nijinsky’s Rite of Spring; and Spiraling Down (2008), a meditation on soccer, aging, and war. In 2010, Yvonne Rainer: Dance and Film, the first major European survey of Rainer’s work was presented at the Tramway in Glasgow, Scotland. Rainer is the recipient of numerous awards, including two Guggenheim Fellowships (1969, 1988), three Rockefeller Fellowships (1988, 1990, and 1996), a MacArthur Fellowship (1990–95), and a Wexner Prize (1995). She currently lives and works in California and New York. A premiere collection of Yvonne Rainer’s poetry, Poems, is newly released by Badlands Unlimited (2011). A nonprofit institution founded in 1974, Dia Art Foundation is renowned for initiating, supporting, presenting, and preserving art projects. Dia:Beacon, Riggio Galleries, opened in May 2003 in Beacon, New York, on the banks of the Hudson River as the home for Dia’s distinguished collection of art from the 1960s to the present. The museum, which occupies a former Nabisco printing factory, features major installations of works by a focused group of some of the most significant artists of the last half century, as well as special exhibitions, new commissions, and diverse public and education programs. Dia:Chelsea is located on West 22nd Street in the heart of New York City’s gallery district which it helped to pioneer. Currently open for artist lectures and readings, Dia is developing plans to expand its presence in Chelsea. Dia also maintains long-term, site-specific projects. These include Walter De Maria’s The New York Earth Room (1977) and The Broken Kilometer (1979), Max Neuhaus’s Times Square (1977), Joseph Beuys’s 7000 Eichen (7000 Oaks) (1988), and Dan Flavin’s untitled (1996), in Manhattan; The Dan Flavin Art Institute, in Bridgehampton, New York; De Maria’s Vertical Earth Kilometer (1977), in Kassel, Germany; Robert Smithson’s Spiral Jetty (1970), in the Great Salt Lake, Utah; and De Maria’s The Lightning Field (1977), in Quemado, New Mexico. *Image above: Yvonne Rainer, “Trio A,” 1966. Performed as part of “This is the story of a woman who…,” Theater for the New City, New York, 1973. 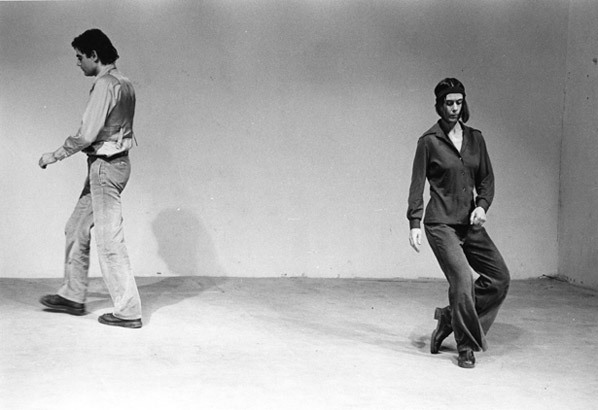 Performers: John Erdman and Yvonne Rainer. * Photo: © Babette Mangolte (All Rights of Reproduction Reserved). Courtesy of Broadway 1602, New York.